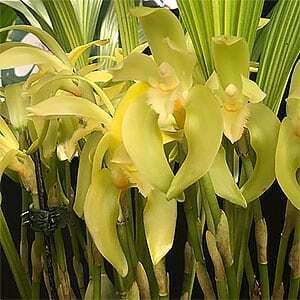 Lycaste orchids are an epiphytic from higher altitudes in central and southern America. Perhaps best aligned with Cymbidiums in terms of care, except that they do require a dry winter. Most Lycastes are a cool growing orchid and require moist conditions. However some are deciduous and others naturally grow in areas with wet and dry seasons. In Australia it is the hot summer nights that present a problem so growing in a well ventilated shade house is a good option. 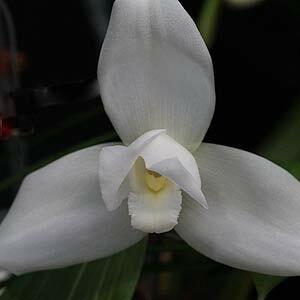 Lycaste skinneri alba (pictured right) is a wonderful white flowering form. If you live in an area with a mild climate, a shade house is usually more than satisfactory for growing Lycastes. You will need to be able to provide protection from winter rains, however this is fairly easy. In the summer a little humidity will help them thrive, you could try misting or even a sprinkler system that waters in the morning, giving the foliage time to dry before the evening. Repotting is best carried out as new growth appears, this will ensure that the root system is active and recovers from any transplant shock. Always use a very free draining potting mix, usually available at good nurseries. Varies between species, generally between 50% and 70% shade cloth. More light when new bulbs are forming. The deciduous species are more tolerant, down to 10 C at night.m Evergreen species need warmer nights down to around 15 C.
Water well from mid spring through summer. Deciduous species close to dry when dormant. Evergreen species a little dries after new bulbs form. Both species need to have some drying between watering. Regular fertiliser during active growth. Species include Lycaste cruenta with its yellow flowers is a well known species. Lycaste fimbriata, schilleriana, deppei (with its fragrant flowers) and macrophylla are other species.